MANILA, Philippines - A 12-year-old kid from Caloocan made all the three coaches turn for him on Saturday's (June 13) episode of "The Voice Kids Philippines." 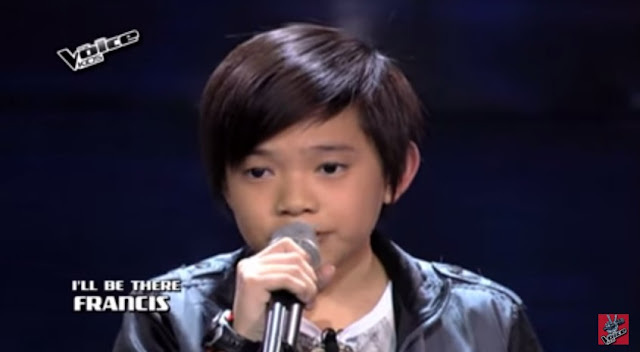 Francis Ryan Lim sang The Jackson 5 song "I'll Be There" which impressed the crowd and the judges. "You made it your own. Sarili mong version yang kantang yan!" Coach Sarah said to Francis. "Iba yung boses mo. There's a certain quality na only Francis eh" Coach Bamboo said. "Never heard a boy sing like that!" Coach Lea said. Francis eventually chose to be part of Team Sarah, joining Kyle Echarri, Zephanie Dimaranan and Gian Ale. At the end of the Saturday's episode, eleven artists already secured the spot to the next phase of the competition, the Battles. "The Voice Kids," which is hosted by Robi Domingo and Yeng Constatino, airs Saturdays at 6:45 p.m. and on Sundays at 7:30 p.m.